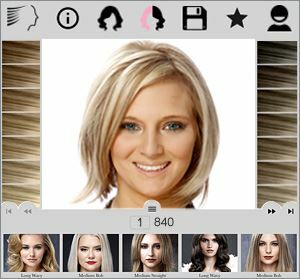 Our Virtual Hairstyler allows you to try on hairstyles that are made from top quality, professional images at a large size. 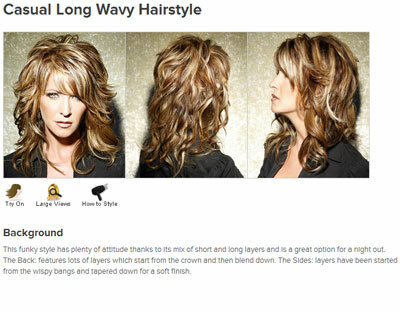 This means that the styles you add to your photo are the most realistic looking hairstyles that you can get! Choosing a new hairstyle and knowing exactly how it will look without the risk of cutting your hair has never been easier! Our extensive database contains 1000s of hairstyles and color combinations: everything from the absolute latest celebrity hairstyles to classic hairstyles worn by movie stars of the past, as well as a big range of hairdos from salons around the world. 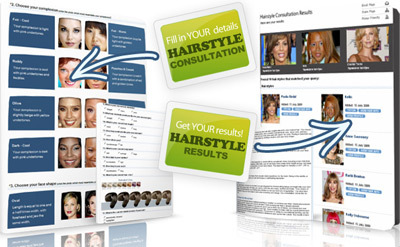 Every hairstyle in our database is accompanied by extensive hairstyle advice, step-by-step styling instructions, and suitability advice about which face shape, hair texture, density, age and other attributes the style suits so you'll know if the hairstyle is right for you! You can even change the color to one of 50 great virtual hair colors and also add a range of highlights. Our simple question-and-answer based hairstyle consultation allows you to select YOUR personal attributes, such as your face shape, hair type and texture, hair length and other options to help make the hairstyle of your dreams a reality. Team this with the expert hairstyle suitability information that we provide with each hairstyle, and you'll never have a hair disaster again!